Join us for Virgin Sport's Twin Peaks Mile Challenge! Use discount code: "TPCONCRETE" for $5.00 off! 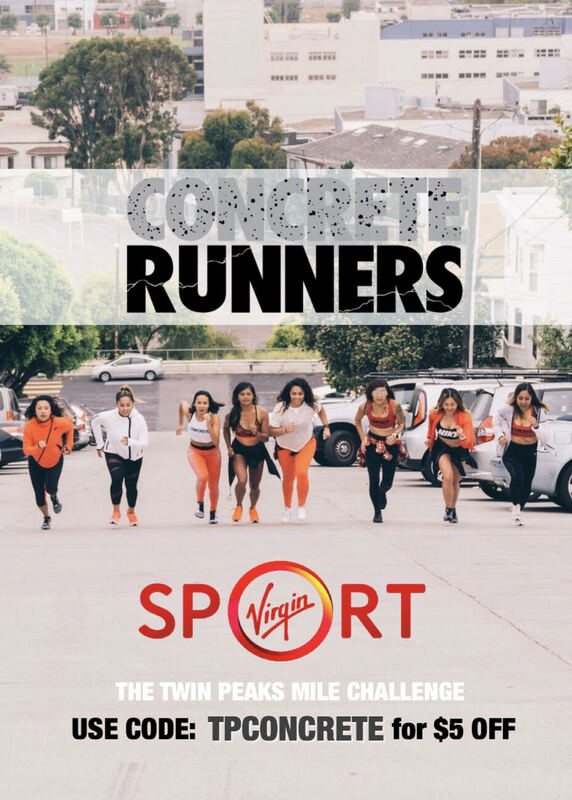 Calling all Concrete Runners! As Season 4 comes to a close we’d like to invite all of our members to come out and run with us one last time at The Virgin Sport Twin Peaks mile. This is the perfect opportunity for all CR members, new and old, to show your CR spirit and represent the baddest running group in the bay area. After all, it’s only 1 mile! And if that’s not enough incentive, the club with the most participants will receive a $500 cash prize. If we win (crossing fingers), we will the prize money for a Concrete Runners after party that will be set at a future date. Whether you’re running the Virgin America ½ marathon on Sunday or you we haven’t seen you in a while, we’d love to have you! This challenge is brought to us by Strava. 1. Sign up for the Virgin Sport Twin Peaks Mile, and encourage others to join too! You can choose your wave or join us for the BETTER TOGETHER wave at 9:40am. 3. Show up and run on Saturday October 14 and upload your run to the Strava app by October 15.